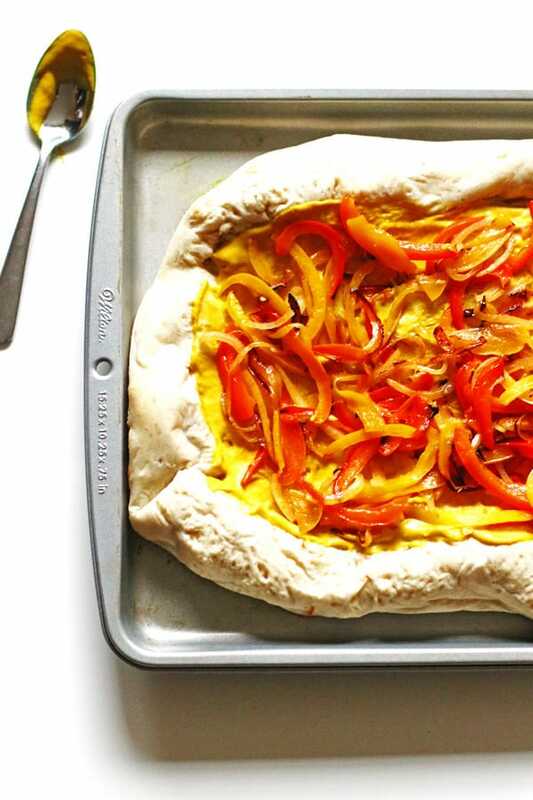 This Supreme Pizza recipe is topped with yellow mustard, sweet peppers, onion. Polish sausage and two cheeses. It is a unique pizza recipe that is bursting with flavor. 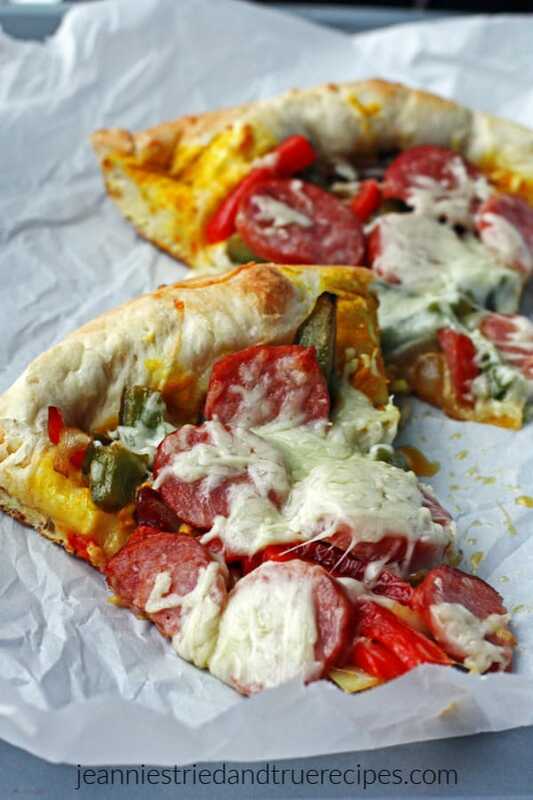 If you like Polish sausage, you will love this pizza. When I am making this pizza it reminds me of Easter. If you come from a Polish family you know what I mean! Easter dinner usually consists of ham and Polish sausage. 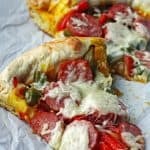 This pizza recipe comes from my husband’s friend who used to be a chef at a local restaurant and he has some fantastic recipes. Besides this pizza recipe, he has also given me his recipe for Buffalo Chicken Pizza. When you bite into that pizza, it tastes just like you are biting into a chicken wing. That pizza is also amazing and is a favorite in our house! 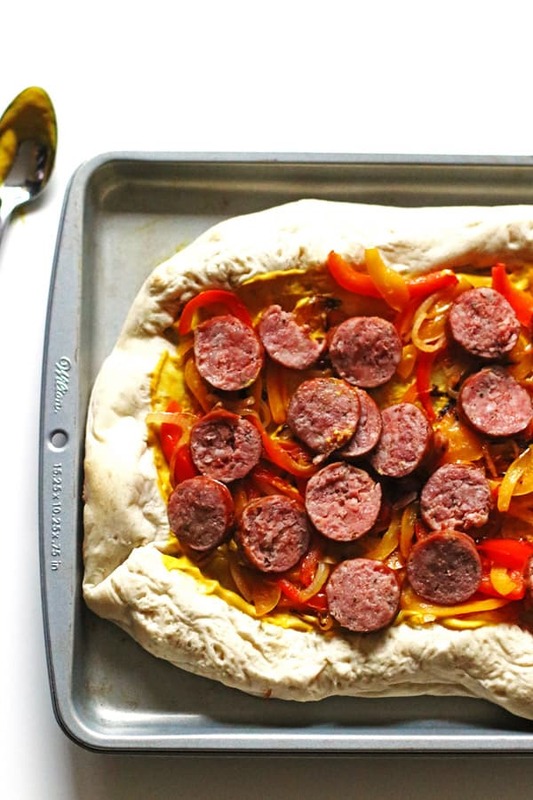 When buying your ingredients for the pizza, make sure you buy the smoked Polish sausage since there are two different kinds of Polish sausage, fresh and smoked. Funny thing is that I really don’t like smoked polish sausage but I love this pizza. It must be the mixture of all the ingredients together. First, take the pizza dough out of the refrigerator and let it sit on the counter to warm up a little while you prepare the toppings. If the dough is warmed up a little it will be easier to stretch out into your pan. Preheat your oven to 450 degrees and butter your pizza or baking pan. Buttering your pan helps get the pizza out easier. Cook the Polish Sausage. The sausage is already cooked so you are just warming it up for the pizza. I would suggest to slice the sausage link into 3-4 smaller pieces before adding it to the boiling water. The best way to cook the sausage for this recipe is on the stovetop. Bring a medium sized pot of water to a boil. Add the sausage and let it cook on a gentle boil for 30 minutes. While the sausage is cooking, thinly slice two sweet peppers and an onion. 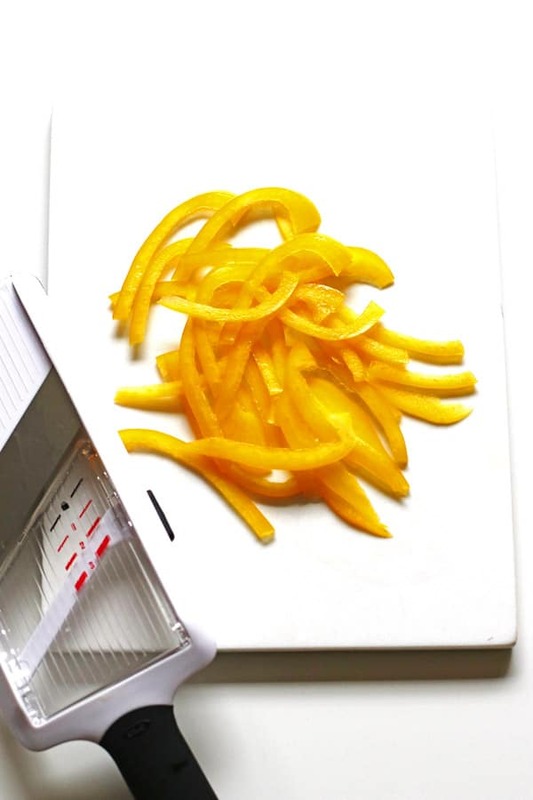 I use my mandolin slicer to cut them nice and thin and uniform is size. Saute the peppers and onion in a tablespoon of olive oil in a skillet. I love using my Cast Iron Skillet to saute them. Heat them until they are soft and tender, stirring occasionally. Once the sausage is done, remove the sausage with a fork and cut it up into thin, round slices. Set that aside. Now that you have all the topppings ready to go, you can put the pizza together and bake it. Stretch out the pizza dough into your pizza or baking pan. I don’t use a rolling pin. I just work the dough with my hands to stretch it out to the edges of my pan. Place it in the preheated oven and par-bake it for 7 minutes. Par-baking the pizza dough is good to do to make sure the pizza dough is cooked all the way through. Especially when it is a heavy topping pizza like this one. After the pizza dough has par-baked, remove it from the oven and spread out the mustard evenly over the dough. This will be your pizza “sauce”. Next, place the peppers and onion over the mustard, making sure they are also spread out evenly. Add the sausage to the pizza. Space the slices out evenly. Sprinkle the asiago cheese and mozzarella cheese over the pizza. Bake for 8 minutes. The pizza is done when the cheese is melted and the crust edges are slightly browned. Store any leftover pizza in the refrigerator. Use yellow mustard for this recipe. Yellow mustard flavor goes the best with the other pizza toppings. Take the pizza dough out to sit on the counter to warm up a little. Warmer dough will be easier to stretch out into your pan. Butter your pan so that the pizza will come out of the pan easier. A baking pan like a cookie sheet will work if you do not have a pizza pan. Par-baking the pizza dough will help make sure the dough is cooked all the way through, especially with it being a heavier topping pizza. Before cooking the sausage, slice the link into three to four smaller pieces. Please comment and rate this recipe if you made this. I would love to hear from you! Have a great day! Delicious pizza that takes pizza night over the top! 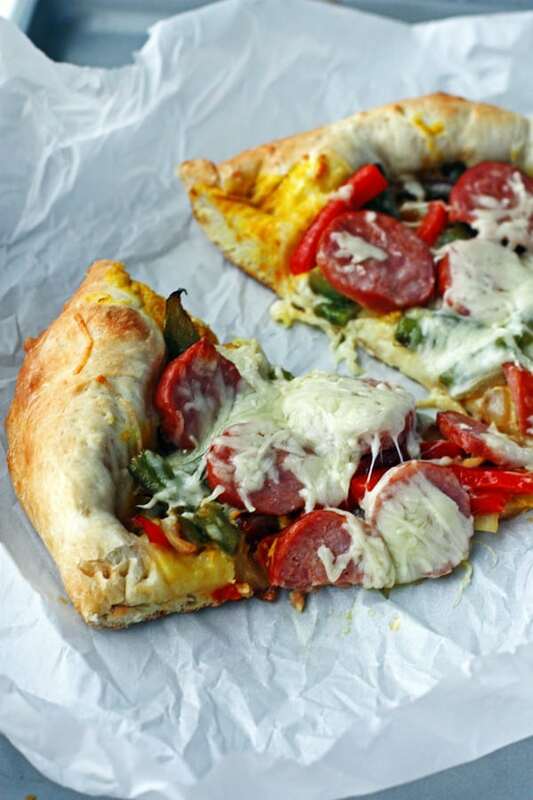 It is topped with mustard, sauteed onion and peppers, smoked Polish sausage and two cheeses. Take out the pizza dough and set it on the counter to warm up a little while you prepare the pizza toppings. Preheat oven to 450 degrees. Butter your pizza or baking pan. Cook the sausage on the stove top. Bring a medium sized pot of water to a boil. Place the sausage in there and let it cook on a gentle boil for 30 minutes. Slice the polish sausage in thin round slices and set aside. While the sausage is cooking, thinly slice the peppers and onion. Saute them in the olive oil until they are tender, stirring occasionally. Stretch out the pizza dough with your hands to the edges of the pan. Par-bake the dough for 7 minutes. Once dough is par-baked, remove it from the oven and spread the mustard evenly over the dough. Then place the pepper and onions over the mustard. Sprinkle the asiago cheese and then top with the mozzarella cheese over the pizza. Bake for 8 minutes. The pizza is done when the cheeses are melted and the edges of the crust are slightly browned. This recipe has been updated with step by step photographs and updated information since the original post in April 2017. I tried this pizza last night. It was a big hit for the family. I was wondering if you tried adding mushrooms to this recipe?